Located in the college town of Tempe, Arizona, Tempe Travel Trailer Villa offers great location and affordable RV park for snowbirds and local residence alike. 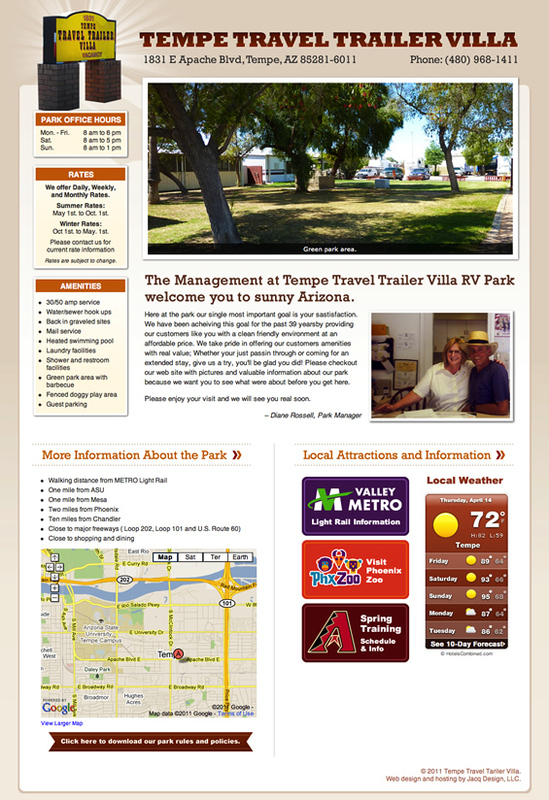 Diane Rossell, the park manager, hired us to help build an one page website design and website hosting for their 40+ year RV park business. We also were hired to take some on-location photos to use on the website and on Google Places to show potential customers what they offer. We also designed custom banners for Valley Metro Light Rail, Diamondback Spring Training and Phoenix Zoo information to help visitors learn more about local attractions. Update 2017: Unfortunately, the trailer park has been purchased by a land developer in 2016, and has turned into a luxury condo complex since.